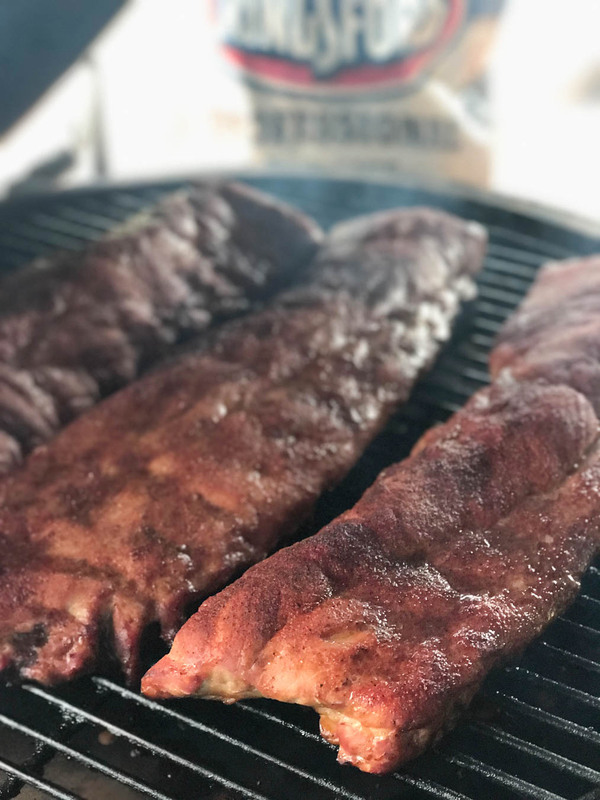 During the summer, Ribs and BBQ are kings of the smokers, and I wanted to share a simple method for cooking absolutely great Memphis style ribs in your backyard. These are not competition-style ribs, but they are how I cook ribs when I am cooking at the house for myself and my family. 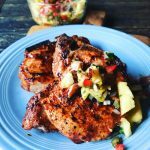 Make sure to make these along with my Creamy Cole Slaw and Maple Chipotle Baked Beans from scratch for a wonderful BBQ meal! In a contest, I am cooking for a set of judges. I don’t know who they are, I am just going off my best guess as to the flavors and textures they will appreciate. Most competitive judges only take 1 or 2 bites of each sample they have to judge. At a normal KCBS contest for example, they may be judging 24 samples of meat amongst the different categories. That adds up to a lot of bites! You really have to pack in flavor and have perfect texture in every single bite in order to stand out and get great scores. When I am cooking at home however, I want to cook with more simple methods than I do for contests. I want to have nice, well-rounded flavors, and I want a texture that pleases me, not a judge (as I grew up in the Mississippi, I like my ribs a bit more tender than the normal KCBS-style rib.) I don’t want to worry about getting the texture exactly perfect, I want to spend time with my family and friends. That’s what BBQ is about, right? Enough about that, let’s cook some ribs! Relative to the hoops I jump through for competition ribs, these are incredibly easy to cook. What makes them Memphis Style Ribs? BBQ “regions” are kind of loosely defined. There’s no hard and fast rules you’ll get traveling from one area to the next defining the absolute recipe that people use. 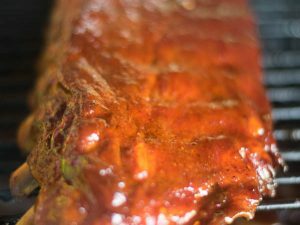 Memphis style, generally, speaks to cooking pork ribs, usually loin back ribs, until they are slightly more tender than most regions. (We would say everyone else cooks them too tough!) 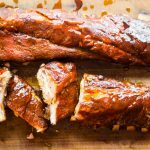 Memphis style usually involves a sweeter dry rub and or a glaze, which is BBQ sauce with a bit of honey for sweetness and glossiness. 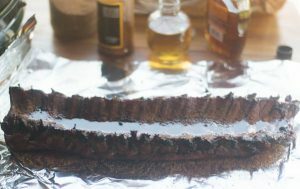 A “dry rib” which Memphis is known for is simply a rib that that you shake extra dry rub on after cooking instead of a glaze. “Muddy style” is where you glaze the rib and then add the extra shake of seasoning. 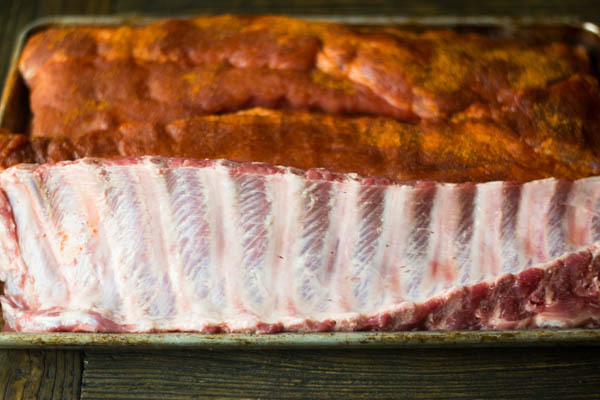 This method for ribs is really simple. I start my smoker (in this case a Big Green Egg, but you can use whatever you have, including a grill set up for indirect smoking) and set it for 250 degrees. When I’m using an egg for smoking or slower cooking, I do use the convection plate. 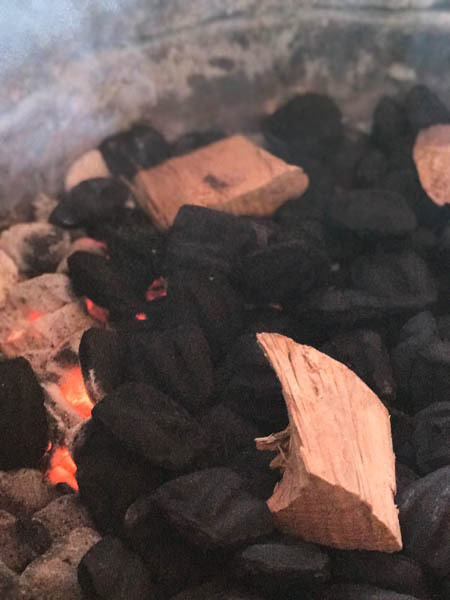 I used Kingsford Professional charcoal for heat and Kingsford Apple Wood chunks for my smoke flavor. How much wood you need will really be up to the smoker you are using. A komodo style cooker only needs a few chunks. When I’m cooking on my Jambo I can burn almost all wood and not overpower the meat. 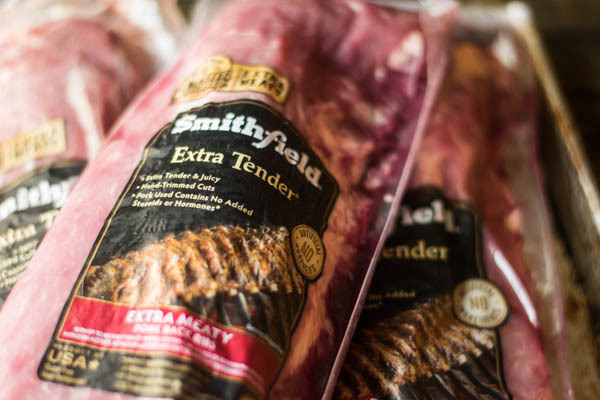 Smithfield ET’s. Extra meaty too! After two hours, get a large piece of heavy duty foil for each slab you are cooking. 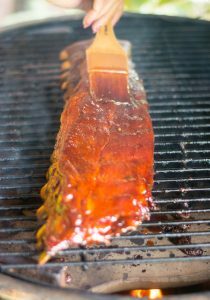 Sprinkle 1 tablespoon of Sweet Memphis BBQ Rub, 1 tablespoon of brown sugar, and drizzle about 1 TBS of maple syrup on the middle of the foil. Place the ribs meat side down on the foil. Repeat the brown sugar/rub/maple syrup on the bone side of the ribs. Pour in about 2 tablespoons of apple juice, then wrap in foil and place back in smoker. Place back on cooker (leaving meat side down) and cook for about two hours. Check after 1 hour, then every 15-20 minutes after for proper doneness. 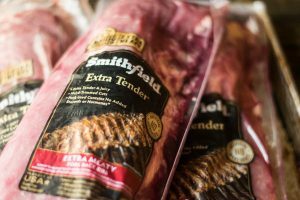 The meat of the ribs should be pulled back from the rib bone approximately 1/2 to 3/4 of an inch, and the rib meat should feel tender. Let sit on grill for 5-10 minutes to tighten ribs if desired. I visited your Arkansas restaurant several years ago and bought your rub and sauce. 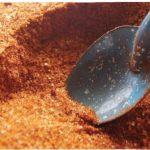 I live in south Louisiana and yours has become my favorite rub and sauce to use on all my grilling and smoking. It has a nice balance of smoky, sweet and tang. I’ve tried several brands and even tried making my own rub. I can see why you’ve won so many awards! Great job! I just bought a Traeger wood pellet grill. Any do’s or dont’s that you can suggest for making great baby back ribs on this style grill. 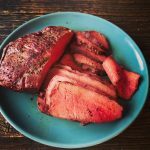 Unfortunately, I don’t use pellet grills much so I don’t have any specific tips and tricks. However, they do a good job of holding a consistent temperature, so it should make it easier to follow recipes until you get the hang of it. Enjoy! Heat info and if course spit in about judging! Should read great info of course and spot on about judging! Oh I have to try this recipe. It looks and sounds amazing! 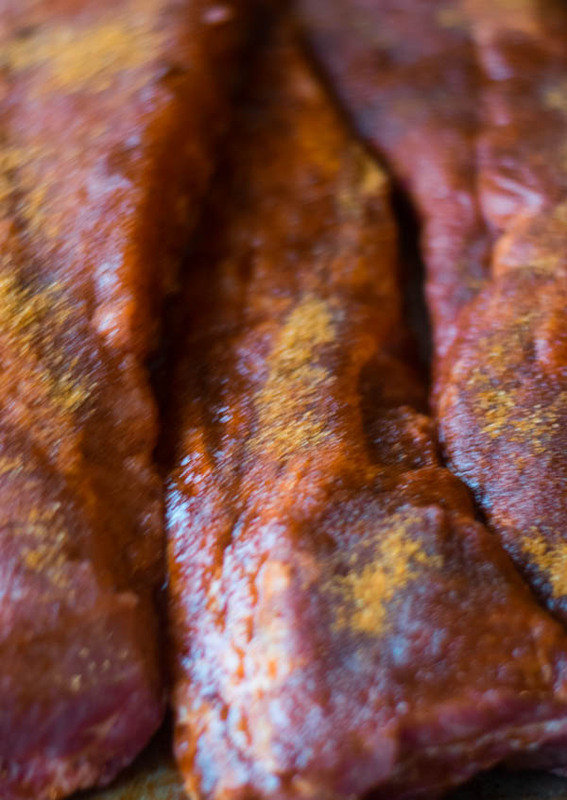 This recipe is making my mouth water… I love ribs. and I love BBQ. 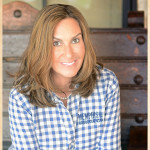 I have been to your Memphis Bar-B-Que in Southaven several times the best bar b que around…..love love love the baby back ribs!!!!! I prefer the dry rub. What is your opinion on brining the ribs prior to using your method? I’m not a big briner! HI melissa, any adjustment you would make for using a backwoods watersmoker? Also, would you adjust the rub if you were making a memphis dry rib? I still use mustard on before rubbing the ribs.